The Gypsy's Guide: Rome's Angels & Demons: Launch Party! Rome's Angels & Demons: Launch Party! 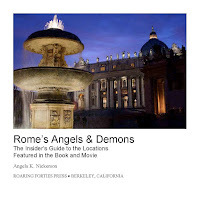 In Angels & Demons, Dan Brown places his fictional characters in the very real city of Rome, lacing together historical realities and fictional possibilities to create a tale so entrancing that copies of the book were seen in the hands of the faithful who converged on St. Peter’s to mourn the death of Pope John Paul II. As a lover of both fiction and Rome, I wrote this guide to give readers and viewers of Angels & Demons a deeper appreciation of the history that underlies Dan Brown’s story. In part, this guide draws on my book A Journey into Michelangelo’s Rome, which explores the life and career of the man who did more than any other to shape the art and architecture of the Eternal City. Not only did Michelangelo inspire artists such as Raphael and Bernini, he also designed many of the defining landmarks in the city through which Langdon and Vittoria race to save the Vatican. The book is filled with interesting tidbits and photos -- including photos by my dear friend, Miss Expatria! And here's the best part: the ebook is FREE! Talk about party favors, eh! I'm having a Tweet-to-Enter Contest, too! 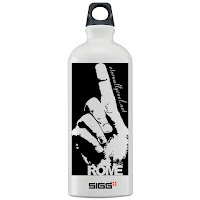 We will choose a winner randomly and announce the results here on Friday, May 22, 2009. Many thanks to Roaring Forties Press and Eternallycool.net for sponsoring this giveaway. 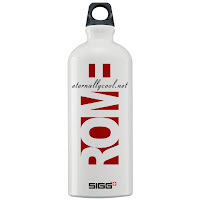 You can purchase your very own Eternally Cool Water Bottles here . 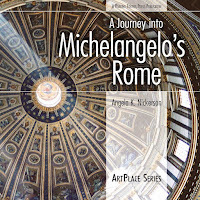 You can purchase A Journey into Michelangelo's Rome here . And don't forget to get your copy of Rome's Angels & Demons: an Insider's Guide! Angela, I'm so excited about your Angels and Demons book and promotion! I've been spending the week talking about Italy and books at A Traveler's Library, and in an hour I'll be going to see the movie. Tomorrow I'll post about it, and link to your page here. This is a GREAT idea. I've downloaded and printed out (sorry, enviros) and I'm going to LOVE the guidebook. Thanks, Vera! I'm a big fan of your blog, and I'm honored you will include a link there. Grazie! Congratulations, Angela! your books are so incredible, this one will be, too. i can't wait to download it (that will be next). brava! Hi Angela, Thanks for this. I just downloaded your guidebook. Will spread the word via twitter as well. Hi Angela! I hope your launch went well. The hubby and I are going to try to see the movie tonight. Thanks for the awesome guidebook. Just discovered your blog today through Twitter.